The BJP is likely to re-nominate all three members of the dissolved Lok Sabha, while it is looking for a strong candidate for the Shimla seat, which was held by its alliance partner, the Himachal Vikas Congress. Swami Virendranand Giri, national vice-president, Akhil Bharatiya Hindu Shakti Sena, today urged the Election Commission to ask all political parties in Himachal Pradesh to vacate schools, religious places and dharamshalas from where they were running party offices and conducting political activities as this was arousing religious sentiments of the electorate and disturbing education of students. Ms Urmila Thakur, BJP Mahila Morcha general secretary, today demanded a party ticket for a woman in the coming Lok Sabha elections from the state. She said the morcha would stress this point with the party high command. 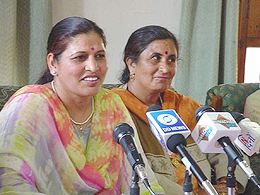 Himachal BJP Mahila Morcha General Secretary, Urmila Thakur, addresses reporters at Hamirpur on Thursday. She is flanked by Sushma Sharma, secretary, district BJP. The hearing in a defamation case filed by the Himachal Rural Development Minister, Mr Sat Mahajan, against former Union Minister Shanta Kumar has been adjourned till April 8. The case was shifted from the court of the Sub-Judge of Dharamsala to that of the Senior Sub-Judge. Both Mr Sat Mahjan and Mr Shanta Kumar were present in the court along with their advocates and supporters. The HP High Court today directed the Secretary (IPH) and the Secretary (HP Public Service Commission) to produce the original records pertaining to the selection process of an Assistant Engineer in the IPH Department. Hundreds of students of the local Polytechnic College boycotted classes in support of their demands, including a ‘golden chance’, for the second day today. They students raised slogans in support of their demands at the college gate. More than 25 persons were admitted with food poisoning in the subdivisional hospital here this evening after they had a feast at a marriage in Birta village, near here. Residents of Sailli village in Chamba district have resolved to set up their village as a model village under the aegis of the Yoga Manav Vikas Trust, Banikhet (Dalhousie). The village has been identified by the Trust for the purpose. The District Magistrate of Chamba, Mr Rahul Anand, has cautioned the people of Chamba against crossing the Ravi and going the riverbed between the Chamera project dam at Bagga and its tailrace outlet at Karian even when there is no flow of water to avoid any untoward incident. The 147th Raising Day of 4th Gorkha Rifles was celebrated with much fanfare and enthusiasm at 14 Gorkha Training Centre, Subathu, 19 km from here, today. Raised in 1857, 4th GR has its training centre and regimental home at 14 GTC. Speaking on the occasion, Brig S.S. Sambyal, the Commandant of 14 GTC, outlined the achievements of the regiment. He appreciated the role of the present and retired officials for bringing laurels to the regiment. He urged the soldiers to continue the rich tradition of regiment. The state election committee of the party, which met at Nurpur last night under the chairmanship of Mr Suresh Bhardwaj, the state party chief, discussed the issue at length. Mr O.P.Kohli, national secretary and in charge of the party’s affairs in Himachal Pradesh, was also present at the meeting. While the committee was unanimous over the choice of Mr Shanta Kumar from Kangra, the name of Mr P.K.Dhumal, a former Chief Minister, also came up for discussion for the Hamirpur seat. The majority, however, was in the favour of re-nominating Mr Suresh Chandel, who had won the seat with a record margin in 1999. Mr Dhumal was a heavyweight but there was nothing against Mr Chandel to deny him the ticket, the members felt. The choice for the Mandi seat fell on Mr Maheshwar Singh, even though the name of Mr Ram Swaroop was also considered. Several names were discussed for the Shimla constituency, which was represented by Dr D.R. Shandil of the HVC in the dissolved House. He had won the seat as the BJP-HVC combine candidate in 1999 but joined the Congress last month. Mr H.N. Kashyap, a state administrative service officer, Mr R.D. Kashyap, a former minister, Mr Megh Raj, a youth leader, and Dr Supa Ram of Sirmour emerged as the front runners. Keeping in view the caste equations, the choice is likely to fall on Mr H.N. Kashyap or Mr R.D. Kashyap. The Central Parliamentary Board of the party will approve the final list on March 15. Talking to mediapersons here today, Swami Giri alleged that the political parties were trying to exploit religious sentiments of the people by carrying out party activities from the religious places. He said the parties were spending crores of rupees for their poll campaigns but were running offices from temples and dharamshalas. He alleged that this was being done to mislead the electorate. He also urged the Sadhu community not to support the BJP as the party was “exploiting religious sentiments of Hindus”. Addressing her first press conference here this evening, after taking over the new assignment as the general secretary of the party’s Mahila Morcha, she, however, clarified that the decision of the party high command regarding the allotment of tickets would be final. Ms Sushma Sharma, Ms Veena Sharma and Ms Kamlesh Kumari were also present on the occasion. Ms Thakur blasted the government for its “failure to complete developmental activities in the state, started by the previous BJP government”. She alleged that cases of atrocities on women were rising in the state and cases of murders were being converted into suicides. She appealed to Chairperson of the Mahila Commission Viplab Thakur to take notice of such cases and provide justice to aggrieved families. She said the Mahila Morcha would create awareness among women and claimed that the party would sweep the elections under the leadership of Mr Atal Bihari Vajpayee. Mr Shanta Kumar had blamed Mr Sat Mahajan of registering himself as a voter at Nurpur as well as Pathankot in contravention of law. Challenging this allegation, Mr Mahajan had filed a defamation case against him. A Division Bench comprising the Chief Justice, Mr V.K. Gupta, and Mr Justice Arun Kumar Goel also impleaded Mr V.K. Malik, member, HPPSC, as a party and issued ‘dasti’ notice to him. This order was passed on a petition wherein two selected candidates for the above said post have urged the court to summon the entire records of the selection process. The HPPSC had conducted an interview for the post on January 7, 2004, and the result was declared on January 9. The controversy arose when a member of the HPPSC, Mr V.K. Malik, filed a complaint with the state government alleging irregularities in the selection process. After this, the state government declined to appoint the recommended candidates and decided to hold an inquiry into the alleged irregularity. The counsel for the petitioner, Mr Rajiv Sharma, contended that the entire records of the selection process should be summoned to put the whole controversy to rest. Now the case will come up for hearing on March 18. The president of the students’ union of the college Ramit Dhiman, told this correspondent that the boycott of the classes would continue till Saturday. If their demands were not met by then, they would take out a protest rally on Monday and hold a demonstration outside the SDM’s office. Meanwhile, the teaching community has told the HP Technical Education Board that providing a ‘golden chance’ to the students was not helpful in imparting quality education to the students. The Chairman of the Himachal Pradesh Technical Education Board, Mr B.R. Rahi, said when last year the ‘golden chance’ was given to the students, they had been categorically told that it was the last ‘golden chance’. Meanwhile, Mr Sunil Verma, Deputy Secretary, HP Technical Education Board, has gone to Sundernagar to discuss the issue with the Director of Technical Education. According to reports, students of all six polytechnic colleges in the state are boycotting classes in support of their demands for the past few days. According to hospital sources, the victims included 12 children. They were admitted in the hospital with symptoms of vomiting and loose motions. Disclosing this here today, Mrs Kiran Dodeja, chairperson of the Trust, said to establish Sailli as a model village, 18 conditions had been laid down, which would be followed by inhabitants for the welfare of the village. These included giving up intoxicants like liquor and cigarette, bad habits like telling lies, creating an atmosphere of workmanship in various development fields, and bringing awareness about generating self-employment. In an official communique issued here today, the District Magistrate appealed to the public that the river Ravi from the Bagga dam to the Karian tailrace outlet was not a dry river. Therefore, the dam could be opened anytime without prior notice or warning signal and water could flow in the river with a high velocity. The 300-MW Chamera Power Station Stage-II is in operation and generating power on the Ravi.